Snow blade extreme athletes in mid-air ballet, wrestling teams in their bulked-out best, Everest climbers with their heads in the clouds, surfers tangling with impossible waves, mountain bikers and fat bikers rolling over the snow, skiers questing for their endless winter on the underside of the globe, and even well-known celebrities all smile from autographed photos, framed in their elements, hanging on the walls above the padded tables and exercise equipment at Physiotherapy Associates. 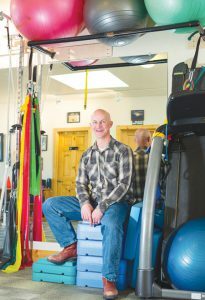 Each one has a story for physical therapist Tim Poppe to reflect upon, documenting his years of helping people heal from injuries, from Houston to Denver to Crested Butte. With this year’s epic snow, Tim says his experience is, “When it snows there are always more injuries and bigger injuries. People are more daring. It’s powder days. You ski hard. Things happen. Bad things. And people are shoveling more so they hurt their backs and shoulders.” It’s been an exceptionally busy year for Tim. When his dad finished his tour with the Air Force in San Antonio, in 1974, the family moved to Houston, where Tim then spent most of his life from age five. Their home was “out in the sticks,” as Tim describes his neighborhood before sprawl and congestion surrounded the ranches, fields and woods he played in as a boy. “We had plenty of places to go ride our bikes and get away from the houses,” he recalls. Riding was his joy and he and his friends rode their BMX bikes all day, building dirt jumps and BMX tracks. In high school Tim joined the school band, blowing cool jazz with his trumpet, influenced by the styles of Maynard Ferguson and Doc Severinsen. Although he enjoyed playing jazz, the music he listened to in his youth was the opposite. “I listened to ACDC, Van Halen and Ozzy, heavy metal and a lot of country. I was all over the board. I never missed a Van Halen concert when they came to Houston,” he laughs proudly. But business just didn’t do it for Tim. “I walked out of my accounting class the second time I attended.” He had thought that maybe following in the footsteps of his father and brother, both accountants, would be a plan since he still hadn’t figured out which direction was best suited for him. “Although economics was kind of cool, being a business major was awful,” Tim concluded, and he circled back to biology. “I went to college trying to figure out a career but I saw that a biology major was going to keep me in school for many more years because to work you need a Ph.D. and you have to learn to write grants and that’s not what I saw myself doing.” He did, however, graduate with a bachelor of science degree in zoology. Tim had started racing road bikes in his senior year of high school, not that there was a lot of that going on in Texas at that time. “But I loved riding. It was hard to find races in the late 1980s in Texas.” So, when he arrived at college, Tim joined the bike team, competing in collegiate racing. It opened up the concept of biomechanics, or body mechanics, which is basically how you set your bike up to fit properly to optimize your performance. He feels it might have been the spark that set him on the path to physical therapy. Tim volunteered every weekend and summers for the next two years, doing laundry, cleaning whirlpool tubs, work tables, and anything the clinic needed done, just to get experience while he finished his undergrad degree. He enrolled at the University of Texas medical branch in Galveston. A three-year program earned him a master’s degree in physical therapy in 1996. Through his volunteer connections, Tim got a job at a clinic in Houston, staying on for several years before he decided to get out of Texas and head to Colorado. “I was spending a lot of time in Summit County skiing in winter and hiking in the summer while I was still in Texas,” he says, and in 2003, he cleverly plotted to combine his ski trip with the chance to relocate and set up a few job interviews in Denver. He moved six weeks later. At his new clinic, Tim worked on many sports injuries as well as non–sports-related injuries, while enjoying his Front Range life. “I thought Denver was amazing back then but now, you couldn’t pay me to live there,” he says. It was while he was working in Denver that Dr. Gloria Beim was building her new surgery center in Gunnison and she was looking for somebody to open a physical therapy clinic in her new space. Tim’s clinic at the Denver physiotherapy office was recommended and his boss offered him the position. Tim moved to Gunnison in 2005, moving up to Crested Butte a few months later. He worked at the Gunnison clinic and began working with the Crested Butte Academy. Eventually, he began taking patients in town. Relatively soon afterwards, he opened his own clinic on the mountain, Physiotherapy Associates. Tim moved his mountain office downtown in 2011, where it’s located today, upstairs from Brick Oven Pizza. He quit the Gunnison clinic in 2014. Tim met Amelia Jervey in 2010, running around in the same circle of friends. “She’s smart and a lot of fun, and we just fit. We have so many of the same interests. And man, does she put up with me! We started dating, got married and now we have a bunch of kids,” he laughs.